The Faithful Homeschool: On a ... umm... pyramid hunt? On a ... umm... pyramid hunt? I am on a turkey hunt! After all, it is November 1st!!! I thought these pictures were perfect for this month. 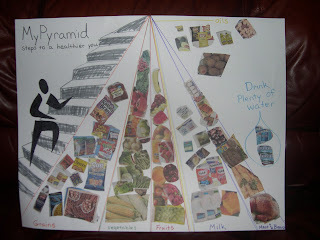 As you can see, we were studying the food pyramid. MyPyramid.gov has some great resources for kids. We rounded up grocery ads to do these two projects. 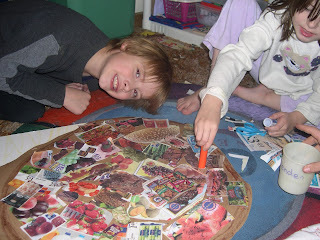 We started with the pyramid so they could get a feel for what good foods looked like. We did some of the printables from the MyPyramid website. We also made our own menus for breakfast and lunch. I even used them on alternating weeks! (the kids got a big kick out of that). 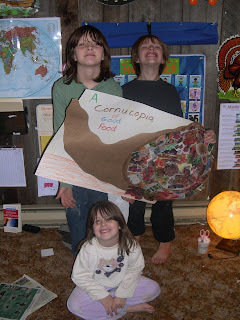 We culminated this November activity with a 'Cornucopia of good food' project (as you can see above!). I used brown packing paper and poster board to make this. The kids cut and pasted the rest. This study was so much fun! I have thought of doing it again... but that would be redundant! I may, however, try a more advanced version here in another year or two. Brooke will be old enough to feel like it is the first time and both her and Brenden will be able to calculate calories and read the labels they could only gleam last time. Happy November everyone! May this month be filled with blessings!